Holy Beta Carotene, Batman! This recipe is rich in beta carotene, with each serving containing 348% of the RDA of Vitamin A. Moreover, they are high in fiber, low in saturated fat, and contain a healthy portion of monosaturated and polyunsaturated fat. Most of all they are tasty and very easy to make in a conventional oven. Who says French Fries are bad for you? Slice potatoes lengthwise into thick slices, and then slice each slice into strips. Cut the long strips in half crosswise. 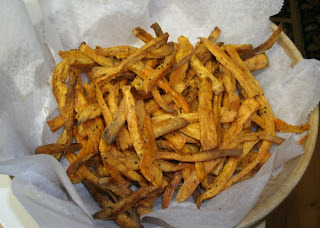 Place sweet potato strips into a large bowl, and drizzle with just enough EVOO to evenly, but liberally coat the fries. Season with half the garlic salt and pepper, toss, season with remaining garlic salt and pepper and toss again. 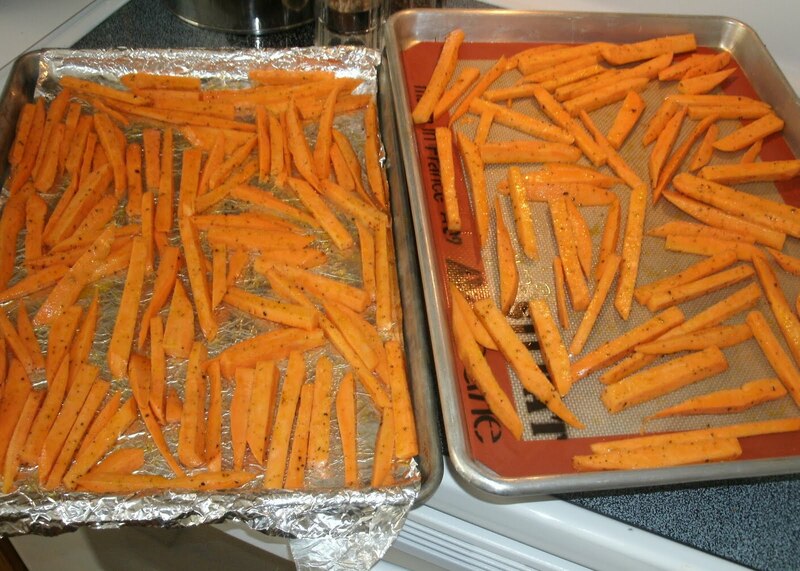 Arrange fries IN A SINGLE LAYER on a baking sheet lined with either foil or a silicone baking mat. Do not lay them in more than a single layer, or they will steam in the oven instead of frying and you'll end up with mushy fries. Use two lined baking sheets if necessary. Roast fries in a preheated 375 degree F. oven for 45 minutes to 1 hour, turning once halfway through roasting. 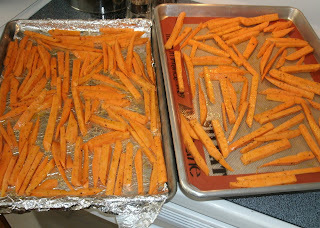 LOVE sweet potato BAKED fries!